Over the past few weeks Mintabie has received, once again, a considerable amount of negative attention from the media. Articles have appeared in the newspaper and there have been segments on TV referring to Anangu (Aboriginal people) from the Lands being ‘ripped off’ by unscrupulous storekeepers who encourage Aboriginal people to accumulate large debts and then coerce them into handing over their key-cards in order to extract exorbitant payments. From the tone of the press releases it is apparent that few sources have been used to gather information, yet the outrage is so powerful that the Minister, Jennifer Rankine has been quoted as stating she will ‘crack down’ on this exploitation and ensure no key-cards will be held at stores. While the blatant half-truths and outright lies have angered Mintabie residents, who are sick and tired of constantly being blamed for many of the problems apparent on the Lands, it was the local Anungu people themselves who decided to take matters into their own hands and redress some of the misconceptions being proffered in their name. 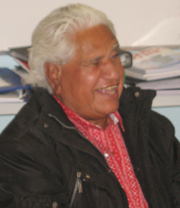 Yami Lester, noted Anangu Elder, from Walatina called a meeting to be held at the Mintabie oval on Thursday 24th April. He publicised an agenda and together with his brother Shannon Kantji called for all interested people from the Lands to attend. A large number of Mintabie residents gathered, but the majority of the people present were Anangu, who travelled long distances to have their say and let their voice be heard in person, rather than be spoken for by a few disgruntled people with personal agendas. Yami outlined the concerns and called for everyone to come forward and speak, sharing their personal stories, outlining their opinions and asking questions. Many of the Anangu took the opportunity to speak. The general concensus appeared to be that all key-cards left at the stores around town were there at the request of their owners, who felt it was one way they were assured that their children and grandchildren were able to have food purchased for them. One speaker mentioned how he had gone to the local community store on the Lands and asked if he could book up some food because his children were hungry. He was told no booking up was possible, so he travelled to Mintabie where he was allowed to purchase food to feed his children and stop them crying. Others spoke about how the store owners can assist in the management of finances by ensuring debts are kept to a manageable level; individual agreements are reached with clients as to limits, and while some leeway is allowed, all in all the onus remains one of responsible management of finances. One respondent noted that, “Mintabie people are good friends. They help when my car breaks down and help feed our kids and grandkids”. A lighter moment came when one speaker stated that he had forgotten how to throw spears anymore and by leaving his key-card at the Mintabie store he was able to get food. Questions about what happens if someone goes away on holiday were raised and the answer came from other Anangu present that there was no problem in retrieving key-cards to take away. All those who spoke asserted that once they came back from their trip they immediately requested the storekeeper to hold their card again! The strongest emotions arose when speakers noted that their key-card belonged to them, it carried their name and it should be their choice as to how they managed it! One speaker passionately stated, “I don’t tell other people what to do with their key-card, they shouldn’t tell me what to do with mine!” This was greeted with an enthusiastic round of applause from all present. Eventually a Resolution was put to the meeting. This meeting held at Mintabie Football Oval on the 24th April 08 passed the resolution that the APY executive facilitate a meeting with the store owners, key-card owners and South Australian Government representatives and, together, resolve conflicts over stores holding key-cards. The resolution was moved by Shannon Kantji, seconded by Mr. A Baker and was unanimously carried. Further resolutions relating to Anangu issues were discussed and voted upon, relating to proposed leasing of APY Lands by the South Australian Government and for greater input by local communities to ensure contracts are tendered for by Anangu in order to empower themselves and their communities. The meeting raised awareness over the difference between the rhetoric that is sprouted about Indigenous self-determination and the reality of actually listening to community members. Politicians, bureaucrats and media personnel all too frequently pay lip service to the phrase “consultation with the community”, yet the Mintabie meeting highlighted the fact that when it comes to reporting issues, all too frequently it is only the few who have a say, those who know how to manipulate the media and provide simplistic, ‘quick fix’ solutions to problems which require a great deal of considered, insightful attention.